During the act of consecration (performed by a priest), the bread (wafer) and wine miraculously are transformed into the actual presence of Jesus Christ. While the bread and wine may appear to be still bread and wine following the consecration, a mystical process has occurred, it is believed. Thus, Jesus is supposed to be physically present on the altar and physically eaten when the recipient ingests the consecrated wafer. 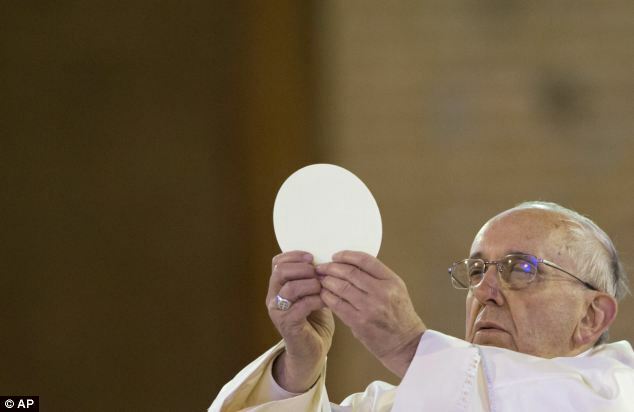 [L]et’s take a look at the actual nature of what occurs in the miracle of transubstantiation. Accidental change occurs when non-essential outward properties (accidents) are changed in some fashion. For example, water can take on the properties of solidity as ice, and of vapor as steam…. In our every day natural experience, a change of substance is always accompanied by a corresponding change of accidents, or outward properties. One example would be the metabolizing of food, which literally changes to become part of our bodies as a result of digestion. To support this view, Catholics claim that transubstantiation was taught by Jesus at the Last Supper. Further, it is also believed it was at this time that Jesus anointed His disciples with this power to transform bread and wine into the actual presence of Christ. In turn, the Catholic Church teaches that this power was then transferred down through the centuries to a select chosen priesthood by apostolic succession and priestly ordination. [T]he first communicants received the First Communion from the Great High Priest himself. The unblemished Lamb of God, about to be sacrificed for their sins and those of the whole world for all time, fed his twelve Apostles—our first band of bishops—His very body and blood, under the appearance of bread and wine, from His own hand. It should be apparent then that the Eucharistic Jesus present on every Catholic altar is of paramount importance to Catholicism and the Catholic faith. Truly the Eucharistic Jesus is the Jesus of Catholicism. However, this Eucharistic Christ is NOT the Jesus Christ of the Bible. 1. Joan Carroll Cruz, Eucharistic Miracles (Rockford, IL: Tan Books and Publishers, Inc., 1987), p. xiii, Imprimatur, Philip M. Hannan, Archbishop of New Orleans, April 25, 1986, p. xxii. 2. Envoy Magazine, “What is Envoy’s Mission?” (http://www.envoymagazine.com/guidelines.html, accessed 09/2007). 3. David Armstrong, “Is This God?” (Envoy Magazine, January/February 2000, http://www.envoymagazine.com/backissues/4.1/god.htm, accessed 09/2007). 7. Joan Carroll Cruz, Eucharistic Miracles, op. cit., p. xxi. 8. David Pearson, “Do Catholics Worship Cookies?” (Envoy, Volume 7.2, 2003), p. 14. 10. Scott Hahn, “The Paternal Order of Priests: An Open Letter to Our Catholic Clergy, In a Time of Crisis” (insert in Envoy, Volume 7.2, 2003) in insert. 13. Joan Carroll Cruz, Eucharistic Miracles, op. cit., p. xxi. 14. Catechism of the Catholic Church (New York, NY: Doubleday, First Image Books edition, Second Edition, April 1995), para. 1324, pp. 368-369. 15. Ibid., para. 1327, p. 369. 16. Ibid., para. 1367, p. 381.